FEATURE ARTICLE: IT’S THE MELODY STUPID!! Thank God that you are never too old to learn something new-well maybe not new but at least in a fresh light. In the beginning of May I am recording with my long time associate and present Quest partner, pianist Richie Beirach and Lee Konitz. First of all, this is a dream come true since Lee is one of my all time heroes. His long interview/book with Andy Hamilton is fantastic and lead me to propose a recording. He is an artist beyond reproach, absolutely concentrated on what he believes in without compromise. If the record “Motion” with Elvin Jones weas his only contribution (recorded in the early ‘60s-decades ago) he would be a giant, let alone his work with Tristano and Warne Marsh earlier. In my opinion, Lee has existed below the radar as compared to others of his generation. In his book and teaching, it is melody which gets the main attention. Through lessons with Tristano and his own personal aesthetic, Lee is adamant about placing melody at the top of the pyramid for jazz improvisation. With that in mind Richie and I decided to co-write a tune together in dedication to Lee for the recording. (Incredibly though we have been altering each other’s work for years, we never have truly collaborated from the start on a tune.) Trying to be faithful to Lee’s aesthetic I wrote completely from the soprano saxophone, purposely focusing on a truly “melodic” statement to give Richie for his harmonization. As has been said for centuries, writing a good melody is the hardest of all compositional challenges. 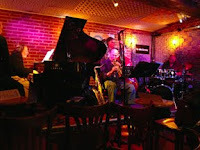 How to decide between one note or another, its placement and duration in the rhythmic scheme, the form of the statement, etc., are the kinds of questions which are impossible to consider while in the heat of improvisational battle, but when slowed down become quite a challenge to consider. Over the course of a few weeks I found myself constantly editing and re-writing to get it acceptable and ready to hand to Richie. What a job!! Try just writing a melody-no bass line-no harmony-just pure melody-not so easy. Saxophonist Sue Terry has a blog and a recent entry is a great summary of how we got to this and where we are. I appreciate her letting me use the text. Sue describes it perfectly. bandwagon with their own download offerings, joining the increasingly popular (and increasingly profitable) Amazon dot com in offering mp3 versions of both major label and indie CDs. If you can't beat 'em, join 'em, thought the record labels, as they proceeded to buy up space on the playing field. The average lot size on the playing field started to shrink. the top of the see-saw. The stuff at eye level in the store display, the newspaper, the magazines, the web. Everything else sinks to the bottom, where the collective weight of it all makes a nice anchor to buoy up the top. There are hundreds of CDs on the Grammy ballot, in dozens of categories. You are supposed to vote only in your area of expertise, but even so, there are many, many albums, artists, compositions, solos, arrangements, and other categories in your field to vote on. The tracks on the ballot are not located on a central website where they can be heard by Recording Academy members. So you can imagine what happens--you end up voting for your friends, your personal favorite artists(regardless of whether you've listened to the track on the ballot), and the tracks you happened to hear on the radio that you liked. There are many other deserving tracks on the ballot that you will never hear. Even if there were a practical way to actually listen to each track on the ballot, you would have to devote countless unpaid hours to reviewing them all and making an honest evaluation. Probably you would still end up voting for yourself, your friends, and your personal favorite artists. Maybe a few others would earn a little checkmark on your ballot, which would then wing its way over to Deloitte & Touche to be counted. And maybe if all the voting members did this, a few great musicians nobody has heard of would get a break. FROM LIEB: Here is a sample deal from an established company with Grammy credibility and a decent catalogue featuring a wide variety of music that was offered to one of my young friends. It came down to basically a bottom line minimum of $4850 plus a “voluntary” $1200 more for radio promotion. This is after the several thousand paid for musician’s fees and recording costs. The “possible” income is 71 cents per CD (minus costs so let’s say 60 cents per “sold” CD) not payable till 1500 copies are sold (a minor hit these days!!) As well, the deal is co-ownership so the artist will never get the music back. I’m not sure about the mechanical fees and all that but it was probably a split deal. So if you do it by yourself and you get it on CD Baby or similar avenues of sales and sell the music at gigs (which is happening less and less because of downloading), you will still be left with hundreds of copies cluttering your bedroom. And if you got some press through private promotion or hiring someone, for that “press” to make a difference in your career, you would need to repeat the process at least once again within a year or two and then one more time again within a short period. This is theoretically meant to sustain any “momentum” or “buzz” that might be occurring about you and your music. Not a pretty picture. Something has got to give eventually----we shall see. a new label, recorded live at the radio station in Hamburg, Germany. 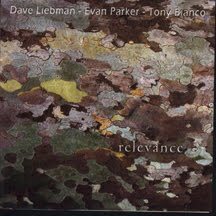 NEW RELEASE:RELEVANCE WITH EVEN PARKER AND TONY BIANCO (Red Toucan): A one time live event from London a few years ago. The liner notes will explain everything about this special occasion. BUT BEAUTIFUL BY GEOFF DYER: (book)Recommended to me by Lucille Humair, this is absolutely the best book I have read on jazz. It is fictional but based on real events that happened to the likes of Bud Powell, Ben Webster, Chet Baker, Mingus, Pres, Monk and others. Difficult to explain here, the book is very well written and truly captures the feeling and spirit of what jazz really is about in human terms, through Dyer’s depictions of a portion of the lives of some of the masters. VERY HIGHLY RECOMMENDED. “Impro-Visor (“Improvisation Advisor”) is a software tool designed by musician and computer scientist Bob Keller to help jazz musicians work out, hear, and record solo ideas, including studying the work of others. It provides a notation capability for lead sheets that consist of a single melody line and chord changes. Melody content can be entered by a point-and-click interface, typed text, or a MIDI keyboard. Chord progressions are entered by typing the chord names or loading from an existing text file. Using the point-and-click interface, notes are sounded with the corresponding chord background as they are entered. Visual feedback is provided by an optional coloring scheme: chord tones show as black, color tones or tensions show as green, chromatic approach tones show as blue, and everything else shows as red. desired or choose alternatives. Ideas can be saved in the vocabulary for later reference. In one use, students submit their solos to the instructor, who then collects them and projects and plays them in the classroom, for mutual critique. NOTE FROM LIEB: Prof. Keller entered one of my solos which features a menu which includes choices of rhythmic feel, ratios of the dotted eighth to other rhythmic values, even noting a latin to swing rhythm, etc. I haven’t had time to get into it but this seems like a very good tool for beginners and elementary players on any instrument. So a student can write a solo on a simple harmonic progression-analyze the color codes for info on what they did and then generate a similar solo on another set of changes. iHearit is an iPhone/iPod Touch app which lets you slow down music without changing the pitch, set loops, and intuitively navigate songs by touching the waveform image. Musicians can use iHearit to listen and practice along with music in slow-motion, loop difficult passages, then slowly increase the speed (even to faster than original). Transcribe licks, patterns, jazz solos, lyrics, etc. and learn the phrasing, time feel, and articulation of the masters much more easily. Visit http://ihearit.net for info. GENE LEES: One of the most astute writers about jazz, politics and humanity in general was this man, whose Jazz Letter was a main source of vital information for the serious jazz community. Gene didn’t pull any punches and always backed his views up with real facts. In a world where good writing has is becoming more and more rare, Lees was a beacon of truth and intellect at the highest level. INCREDIBLE ROYALTY: got a check for 18$ coming form the AF of M (musician’s union) “Intellectual Property Rights Distribution Fund” for my “services” recording with Miles “On The Corner” and “Get Up With It.” Imagine-thirty seven years later and I’m still getting benefits from the Prince of Darkness!! 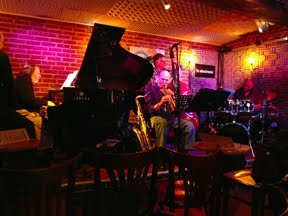 MAY: Dave Liebman Group at the Deer Head Inn, Delaware Water Gap, PA USA; Heidelberg, Germany; tour with Michael Arbenz Trio; “Quest” concert in Santiago De Compostela, Spain; concert and clinics with “We Three” ( Adam Nussbaum-drums/ Steve Swallow-bass) in Essen, Germany and Sevilla, Spain; recording with Richie Beirach and Lee Konitz; Miles Davis tribute at Iridium with Tom Harrell and Jeremy Pelt, New York; clinics and concert at University of Cincinnati, OH.